The Port Orange community suffered a significant loss this January when we lost our patriarch Richard E Caton at the age of 80. These words echoed many sentiments in our community upon hearing of the loss of Mr. Caton. After almost a lifetime in the Port Orange area and a servant to it both professionally and personally, we pay homage to the man who set the precedence for the Caton Hosey Insurance Company we are today. In 1959, Mr. Caton took over the then Caton Insurance Agency from his father. 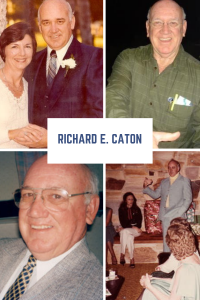 For the next thirty years until his retirement in 1990, Mr. Caton continued the growth of the agency laying deep roots in the Port Orange area and expanding to the building on Nova Road in Port Orange that we still call home. Richard was very much involved in the community, serving as The South Daytona -Port Orange Chamber President and was the head of the Planning Board for the community as well in the 70 and ’80s. If you would like to celebrate the life of Mr. Caton, please consider donating to the charity that was near to his heart: Florida United Methodist Children’s Home at allchildrenfirst.org., 51 Main St., Enterprise, Fl 32725. The mission of The Florida United Methodist Children’s Home is to empower children and families to experience God’s love and care as revealed in the ministry of Jesus Christ. He is survived by his wife of 60 years Pat, his Son Rex Caton, Daughter in law, Barbara, Daughter Lora Caton and his Grandchildren Allie, Dallas and Donovan Caton. Agent Keri Harris Presents on Flood Insurance @ Exit Realty Today! Caton Hosey at Rayz Awareness 5K in Ormond! Team Caton-Hosey at the Holiday Classic 5k benefiting Childhood Cancer! Check out our newest banner for the gym! Restaurants! Today is the final day to be our (free) guests at this week’s show ~ a $65 value!